At 4pm EST on September 18, Ferrari debuted its full communication on the new Ferrari California. Of course, this online event is probably more for auto enthusiast geeks like myself than the average Ferrari buyer who is too busy trying to find employment now that Lehman Brothers is bankrupt. Good timing Ferrari! Just in time for the global financial crisis, good thing golden parachutes are the norm these days. Timing aside, Ferrari has been doing one of the more interesting delayed vehicle reveals. 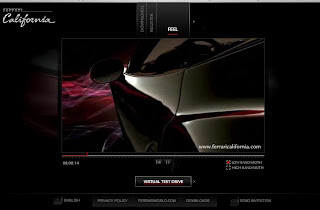 It all began several months ago when they launched their Ferrari California web site complete with a countdown clock and, the interesting part, “Hear”. “Hear” simulated the sense of sound by allowing the user to click on various sound environment features thereby letting the ferocious sound of the exhaust note be enjoyed even if you can’t afford one. Their next debut came with the “See” content. Finally, the official images, some downloadable wallpaper, and a screensaver were made available for PC and Mac. By this point the car’s full look inside and out was clearly communicated unlike some of the annoying delayed reviews from Citroen GT, Ford Mustang, and Porsche Panamera. The final installment that arrived for the Paris Auto Show reveal is “Feel” and what a rich experience it is. There are 11 videos all done to showcase the car: the premier, backstage, interviews, after party, the typical road cruise full of beauty shots, and what everyone was waiting for the President’s speech… okay just kidding about the last one, but hey someone took the time to film his talk so post it to the web site. Overlooking the President’s speech, the films are interesting and really build a lot of passion for the car along with bringing everyone up into the debut beyond just filming the typical stage introduction of the car on the media day. The videos are really for brand passionate visitors, which I’m sure there are a lot of when introducing a historic nameplate like a California GT. What I find most compelling about the Ferrari California website is the way they did a staggered delay to reveal. They also accompanied the reveal with a lot of photos sent out to auto enthusiast sites, prior to the auto show reveal, to generate some early buzz for the car. Vehicle shots were not isolated to showing one photo of a headlight or a shift knob; instead, Ferrari realizes the car is beautiful in its entirety and that showing a couple professional shots of the car would generate more passion for the car than just feeding the public a small corner of the car’s exterior or interior and to keep building suspense by progressively releasing more and more professional shots. Teasing with minute photos of each part of the car is excruciating. If you want to tease, please do it the Ferrari way and not the Citroen way.